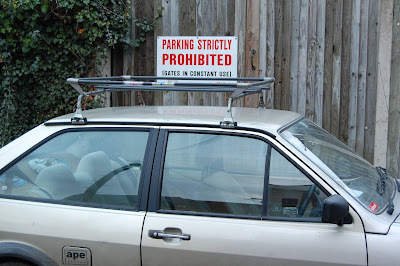 If I ever have to protect a parking area I think I'll go for machine guns and razor wire, signs don't seem to work! The sign is behind a skate shop on East Reach, if you notice the stickers on the car it looks like this belongs to one of the skaters, not that I am saying that skaters are more likely to park illegally of course! Darn skater mentality anyway...lots of them down here in So Cal...never amount to much anyway...unless you're Tony Hawk, namesake of the video game of the same name! Interesting shot.